On May 8th, 1863 JMG was discharged from the 10th Maine and would spend the next eight months enjoying the comforts of his home city of Portland. However, just because this break in service was far away from the seat of war did not mean it was to be uneventful or insignificant in Gould's life. In the course of this time several key events occured which merit attention. The first was the marraige of his intimate friend Edmund S. Morse. Gould wrote - "The boy has gone and done it." This was a great "loss" to JMG as it meant that he could no longer enjoy first priority for his friend's attention and reminded JMG that his own youth was quickly fading and that after the war he would have to shoulder the responsibilities of manhood which included pursueing into a career and raising a family. The second was his experience of becoming a "born again" Christian. This was facilitated by his infatuation with Adeltha Twitchell who had recently "seen the light". Although JMG would eventually lose Adeltha to another suitor he would never lose his faith in Christ as his Lord and Savior. Despite his removal from the war this did not mean that he would fail to see action in the service of his country during those fateful days. In June of 1863 it happened that the rebel commerce raider Tacony was menaceing the New England coast. On the morning of June 26th the Tacony slipped near to Portland harbor and the Tacony's crew quickly captured the Revenue Cutter Caleb Cushing. The rebels then made a run for it in their new prize. A watchman at the Portland observatory noticed that something was amis and spread the alarm. With no formal naval militia system in place the townsfolk quickly commandeered a couple of steamers in the harbor and made chase. JMG was one of the citizen volunteers in this peculiar sideshow of the greatest conflict in the nation's history. 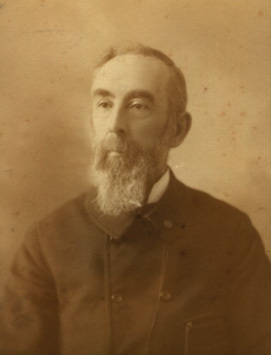 At 10 O'Clock AM Gould was informed of the impending pursuit of the rebels and, in reaction "buckled on my pistol and made good time to the wharf". At 11AM the steamship Chesapeake left Brown's wharf with JMG on board. The ship was armed with two rifled six pounder guns, about 30 men from the 7th Maine regiment and about 30 civilian volunteers. As the wind was "a meerest puff of a south wind" about 50 sailing ships were becalmed in the harbor. As the Caleb Cushing was a sailing vessel, it was hampered in its escape attempts. At about 11:45 the paddle steamer Forest City, which had left in pursuit ahead of the Chesapeake, was fired on by the Cushing. The Chesapeake, being more heavilly armed that the Forest City, took the lead and closed in on the Cushing. The Chesapeake then fired two shots at the Cushing. Then it was noticed that a boat was then set out from the Cushing which contained the cutter's captive crew. The crew was quickly recovered and then it was noticed that the Cushing was on fire. The rebels, seeing that escape was impossible, abandoned the Cushing and set out in two boats which were quickly captured by the Forest City. Before leaving, however, they had set explosive charges on the ship. At 1:50 PM the Cushing violently exploded and went to her eternal reward. 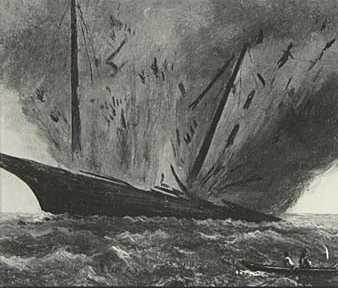 Gould described it thus - "A volume of black and red flame shot up from the whole aft part of the schooner. It reached in a second of time its altitude and then with a lesser force expanded into one grand immense wreath of smoke, the debris commenced to fall and the fire to disappear. Similtaniously with this grand explosion came the report (sound) adn the effect was beyond all description. Cheers went up for all the vessels in the vicinity and a hundred echoes come from the hundred islands of our bay." Upon his return Gould, in his caracteristic manner of recording events for posterity, gave the news of the incident to his friend Steve Barry "to be telegraphed over the country by the Associated Press". Gould, along with the other volunteers, recieved a special commendation from the mayor of Portland for his participation in this event. The Report of Lieutenant Merryman of the Revenue Marine also provides a detailed description of these events. For more information about Confederate operations on the coast of Maine read Confederates Down East by Mason Philip Smith. For a concise account of the above incident, see Herbert C. F. Adams, "The Comedy of the Caleb Cushing," Civil War Times Illustrated, January 1982. On September 16th, 1863 JMG again answered his country's call and enrolled in the 29th Maine Veteran Volunteer Infantry Regiment being formed in Portland. He was commissioned in the same position that he had in the 10th Maine as Regimental Adjutant with the rank of first lieutenant. Many veterans of the 1st and 10th Regiments were on its roles and the regiment tried to get redesignated as the 1st Maine but was unsuccessful. The 29th was mustered into Federal service on December 17th. It was a three year regiment of "veteran volunteers" meaning that it would serve for "three years or duing the war" and that its members were mostly veterans with prior service in the war. Unlike the 1st and 10th Maine, the 29th would take its time before departing for war service. It took several months to recruit a sufficient number of volunteers and the 29th would finally ship out on January 31st, 1864 when the regiment departed on a steamer for New Orleans and service in the Department of the Gulf. Upon arrival in New Orleans on February 16th the 29th was assigned to the 1st Brigade, 2nd Division, 19th Corps, Department of the Gulf. In March it was assigned to the 1st Brigade, 1st Division of the 19th Corps. The 29th participated in the Red River Campaign in Louisiana under Major General Nathaniel P. Banks, a popular but incompetent general, in the spring of 1864. Banks was more successful in politics becoming an Congressman and Governor of Massachusetts. The Red River campaign was an unsucessful effort to destroy the Confederate industrial center of Shereveport. The Union forces, suffering from disease and inadequate supplies, were forced to retreat before reaching their objective. The only battles which JMG participated in during this campaign, which he considered significant, were those of Sabine Cross Roads on April 8th, 1864 and Pleasant Hill the following day. As fate would have it, far more men in the 29th died of dissentary during this campaign than in battle. On March 17th Gould wrote - "Our sick list was not much increased by the march. The diarrhea has gone off so much from the doctor's report that we call ourselves very healthy now." In this Gould confirmed an observation that regiments on the march were less likely to be sticken with illness than ones in the same camp for a long time. The reason was that being in camp exposed the troops to the same unsanitary conditions on a regular basis whereas on the march they would be more likely to be drinking fresh water and not be around unclean refuse. Another dimention of the war which Gould's diary reflects on is the use of freed slaves by the Union army. On April 1st Gould wrote - "Our officers pick up valuable negroes for servants. I haven't taken a fancy to one yet. Green has got an 'intelligent contraband' for the N.C.S. (Non-Commissioned Staff) mess." Army pay tables of that year would allow "African Under Cooks" to be paid $10.00 a month compared to $13.00 a month for an infantry private. In 1863 blacks were allowed to enlist in the Union Army and by the end of the war over 100,000 had worn the blue uniform. On April 4th Gould found himself in a town and visited an Episcopal Church. "A western chap came in and was anxious to try the organ. He blew and I played a few old familiar Psalm tunes. Presently a western captain came in, swearing and raving drunk ... . I had shut up the organ but the captain opened and commenced pounding away with no stops drawn. ... I went down to the Provost Marshall, asked him to arrest the captain and put a guard on the church which latter he said he would do and gave the orders. I went away thinking over this question. If a church is sacred is it worse for a drunked captain to abuse the property than for a Christian Adjutant to violate the sanctity of the church?" May 9th - "The worst feature of the present organization is the utter worthlessness, morally and religiously, of the Surgeons and of course their wickedness goes clear down to the last man under them. The Surgeons drink up the U.S. wiskey and the Hospital Stewards wear the Sanitary Commission clothing and the Ward Master sleeps in linen sheets while the men in fever rot in lousy shirts for want of a change of bedding. The cooks eat the best of everything and the whole working force of the hospital have to be fed first before the sick can come in for the morsel tht is theirs." May 11th - "I was thinking today that the war will never end till every foot of southern soil was trodden over and fought over and retreated over from Virginia to Texas there should be waste, ruin, desolation and Bones. Only Divine mercy can pardon the south and excuse them from utter annihilation. Only Justice will consign them all to destuction. It seems to me that this expedition failed so that another might me necessary and each will impovrish the country and carry misery to those who have lived to oppress." On June 3rd, 1864 JMG had an enlightening conversation with a freed slave named Anderson who Gould found "faithful, intelligent and well behaved". Gould wrote that "I have been anxious to learn more of the real character of the institution which by some is called 'Divine' and by some Satanic." and in Anderson he found the information he sought. Gould recorded a condensed transcript of the conversation and it is probably amoung the few accounts of American slavery given from the view point of a slave. In the course of the conversation Gould asks Anderson about a number of aspects of slave life. In particular these included marraige, religion and education - the very foundations of Gould's value system. In each case he heard first hand how the institution of slavery denied their benefits to the slave. In conclusion Gould wrote - "The man who can see anything Divine in slavery has eyes I do not pray for. We have (in the) North, and the world over, a system of crushing the poor and the weak and building up the wealthy, but the sin appears to me to be a mere flea bite along side of this Lousiana slavery." After the Red River campaign the 29th was shipped north on July 2nd on board the steamer Clinton back to Virginia where it would be assigned to the Army of the Potomac for the final campaigns of the war. Upon entering Virginia waters on July 12th Gould heard from the pilot on the ship that the Confederate raider Alabama was sunk. Gould exulted - "Three cheers and a tiger for that!". The Clinton made a brief stop at Fort Monroe which guarded Hampton Roads. 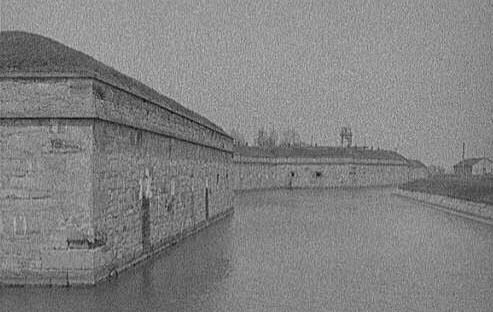 Gould wrote - "The Fortress Monroe is a grand structure. We do not realized how much we saved the country by saving that. ... As a huge work of man I think Fortress Monroe would stand at the head of the list. They say it covers sixty acres of ground but this, if true, conveys no idea of its size. ... Now the moat and the ditch as you would call it is in reality a great canal with stone banks. It is wide enought to float three or four good sized ships, all abreast, but probably not deep enough." Regarding the fort's interior he wrote that his party "... found ourselves in the outskirts of a snug little village or so it appeared at least. There were houses trees, walks, streets, hydrants, and everything as natural and comodious as need be. There are large fields growing grass, I wont say there is land enough to raise a crop for the garrison, but it is sure that good care would give them all the vegitables they would want." It is worth noting that Gould's observation would be much the same if made by a modern day visitor to the fort - although he would find that soccer fields have replaced the grass fields. The Clinton proceeded up Chesapeake bay and entered the Potomac river the next day. The 29th was disembarked near Washington to await further assignment. From July 13th - August 9th the 29th was assigned to forces which marched between Harper's Ferry and Washington to guard against the the threatening movements of Jubal Early's cavalry corps. On August 10th the 29th was assigned to the Middle Military Division under Major General Philip Sheridan. The division's mission was to guard the Shenandoah Valley against Confederate insurgents. "My heart went down to my boots when I looked to the front. There was the advance of our Second Division coming back on the dead run. The second line was advancing very slowly and it grew slower and slower and stopped. The men fell fast from their ranks and were leaving them faster wounded, or with the wounded. The main part of the 2nd line of the 2nd Division appeared to act as if it was going to hold on, but the rebels swarmed out on the right and fired into their right flank, so by man the right of the Second Division gave way and made for the point of woods on our left. It was a trying sight." "We were almost into the woods where the rebels had been when we saw General Sheridan and others. Curiosity prompted us to ride up and see the General. An aide from the cavalry came in and reported that the cavalry was on the right. They had been chasing the rebels in from Martinsburg and Bunker Hill all the day. "Charge" the order was from old Philip. 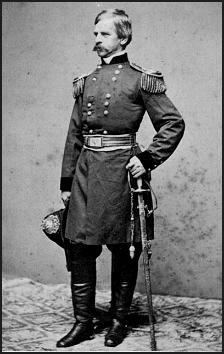 (Note - General Sheridan was only 35 years old at the time.) The Aide expostulated. The cavalry had been out many days and nights he said; they were completely exhausted, their horses couldn't move past a fast walk. Sheridan cut him short with many oaths and "Tell him to charge. Tell him I say charge. We've got the rebels on the hip. Tell him we have whipped them on our left and front and he must charge the right. Do it quick. I don't care a ---- for horse flesh today!" "Then the sad stories of our own losses. The 114th New York all cut to pieces, a sacrifice by which we are safe. We pity them the poor fellows, they have done the true Christian deed of dying that we might live." The major battles the regiment was to engage in were Opequan on September 19th, 1864, Fisher's Hill on the 22nd and Cedar Creek on October 19th. On December 20th, 1864 there was a vacancy in the position of major of the regiment (third in command after the colonel and lieutenant colonel) to which JMG was elected by the regiment's officers. This is especially significant as it would have been normal practice to choose one of the regiment's ten captians commanding the line companies to such an important position. As adjutant, JMG held the rank of 1st Lieutenant and was promoted over the heads ten of his superiors by their own votes. On January 1st, 1865 the 29th moved to Stephenson's Depot and built their own winter quarters - log cabins with tarpaulin roofs. The 29th would remain there until the end of the war. On March 17th the regiment recieved and order from General Hancock that infantrymen were not to wear boots "under pain of confiscation". Boots were more popular among infantrymen as they provided better wear than the standard issue shoes and those who could afford it often purchased a pair. Gould commented - "This in my private opinion, is far fetched and nothing worth and General Hancock has undertaken something that he will not be able to carry out." Carver General Hospital, Washington, D.C.
On April 1st JMG fell ill and was sent to the Island hospital in Harper's Ferry on the 5th. He was later diagnosed with "Bilious Rimittent Fever". This was the only time he was sick for an extended period during the war. He was in the hospital when General Lee surrendered on April 9th.